A favorite pander of Republicans and especially Mitt Romney is that President Obama stifled increases in oil and gas production through overregulation and refusal to issue drilling permits. Is there any truth at all to these claims? Not a bit. Baker Hughes, Inc., the industry gold standard source for information regarding oil and gas drilling rig counts, provided the data for the following chart from haynesvilleplay.com. Panderbear finds this graph of U.S. oil and gas rig counts fascinating. Note first the dip in the numbers as a result of the drop in demand accompanying the Great Recession. No surprise there. 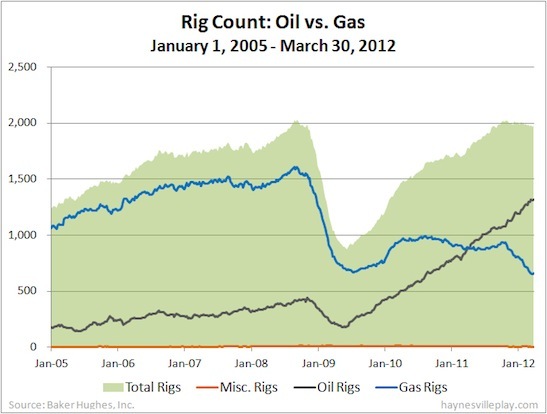 However, after less than a year the oil rig count began an awesome rebound that continues unabated to the present. At the time of the president's inauguration the count was ~250. It is now ~1300. That represents an increase of a factor of 5+. President Obama is stifling an increase in drilling? Bull. Republican claims to the contrary are pure pandering to those who haven't bothered to looked at the data. In particular Romney has claimed the president has decreased drilling in the Gulf of Mexico, but according to Baker Hughes as of April 5, 2012 the percent change in oil rig count in the Gulf in the past year is +138%. There's no excusing the fact that Romney is just plain lying. Is there anything he won't say or do to become president? What about gas rigs? They don't seem to be recovering. There's a good reason for that. Due to increasingly efficient extraction methods production is actually up even though the number of rigs is down. There is currently a glut of natural gas on the market. Production has gotten way ahead of demand. All natural gas storage facilities are bulging at the seams and prices have stabilized at low levels. If Republicans want to attribute blame for high oil prices they'll need to look elsewhere than President Obama. The president has presided over a huge increase in producing oil rigs. Panderbear suggests Republicans look at global demand, which really sets oil prices, and at the fact that America's oil corporations made gasoline, diesel, and jet fuel the number one U.S. export last year. But of course Republicans and more than a few Democrats, know Big Oil can do no wrong and just voted to continue their multi-billion dollar tax subsidies even as oil company profits are at all time highs. Sigh. Associated with the natural gas boom, which is a world changing event by the way, is the cheap price of natural gas and its derivatives. The major gas companies are hurriedly converting all of their truck fleets to natural gas burning engines. Cheap and efficient. We do not need the pipeline from the Canadian shale efforts. Pay no attention to that scree. In fact, development focused on planting natural gas vehicle fueling stations along the I-40 and I-10 corridors for trucking fleets to begin converting to natural gas engines is a very large fuel savings for the US and not to mention an infrastructure project with impressive job growth associated. Who do we trust to focus on this? Romney? Somehow I think not. Obama? Sure. I worry less. Separating ourselves from reliance on oil imports is a monster continuing project. Conservation plus conversion to our ever plentiful natural gas usage is top priority. And, of course, at the same time we must hold the gas boys to some environmental rules. Currently they are frighteningly unfettered and in denial mode. Do we trust Romney with that? I think not.